I wanted to come back to this topic because I know there are so many of us that worry way too much. I want to try and help ourselves worry less. I realize that most of will still worry about our kids, money, well you know the big things. Maybe, just maybe we can worry less with a few tips or tricks. We have convinced ourselves that worrying helps. We think if I can find a solution then I will stop worrying. We tell ourselves that we don’t want to overlook anything or be surprised and I want to be a responsible adult. All of these things lead to worrying. We can’t sleep, or when we try to sleep we can’t shut off our brains. Then we start to have negative thoughts. These actions make us go in circles. When we worry, we become negative and being negative makes us worry. This is not a healthy way to live my friends. I have a few things that I have been doing to help myself worry less. So far, so good. Hopefully by sharing these ideas, they will help you too. DO SOMETHING: When you find yourself being tortured over something, stop thinking and do something. Go to your to-do list and start checking things off, get some chores done, exercise. If we do something that has a physical action we tend to think about the action we are doing and not worry. I have been practicing this one for a while. When I find myself fretting over something, I make myself do something, I clean the kitchen, do laundry, finish a craft project or just go take a walk. SMASH THE WORRY IN THE MOUTH: I don’t meant that literally. If there is a problem that can be resolved, then get to it. Smash that problem with a big hammer and move on. Stop worrying and get rid of the problem. Facing things head on takes some courage. Lace up them boots and be fearless. This one is getting easier for me. I am a big chicken and I hope/pray/worry that the problem will just go away on its own. Well, it doesn’t work that way. The ball is in my court and I get the privilege of smashing the ball over the fence. That feels real good, when I am in control and solve my own problems. ASK FOR SUPPORT: Talk to your friends and family. They will have a different perspective and can give you some great insight. I know for myself, if I just say the words out loud to someone then my worry is less. LISTEN TO MUSIC: I love music, but I don’t listen enough. When I see that I am worrying, I plug in some digital music and just listen. Sometimes I sing along. Here’s the fun part. When I listen to music it gives me energy, I am able to get more work done and it relaxes me. Music is a wonderful thing and I have to remind myself that I love music and I should make sure that I get my music anytime I can. WRITE IT DOWN: One of my aunts told me when I was a kid to write down my bad thoughts. I hadn’t practice that in a long time, but I am doing it now. I have a worry journal. Just like keeping a blessing journal, it works the same way. The big difference is, when I am done worrying, I take that sheet of paper and either burn it or shred it. This works great for me because it allows my brain to know that the problem is done and I have no need for it anymore and it’s gone….literally. If you keep a Blessing Journal, go back a read your blessings, this relaxes me too and takes some of the worry away. HOPE FOR THE BEST-PREPARE FOR THE WORST: This is an old saying but it does ring true. This one is hard for me. I have no problem preparing for the worst, it’s that ‘hope for the best’ part that gets me. Having hope can be hard for a worrier. Hope has no action, it’s just positive thinking. Yep, that’s right, it’s time to start thinking a little bit more positive towards our problems and life in general. The funny thing is, where there is hope there is positive thinking. They go hand in hand. Preparing for the worst is the easy part for most of us. 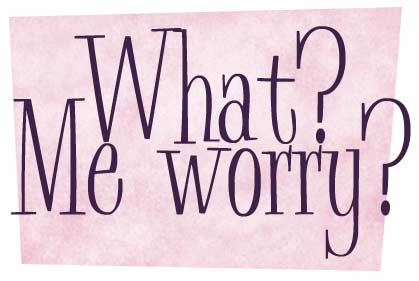 When we worry, we tend to think about the worst possible outcome. Here’s the hard part, accepting and I really mean, accepting the worst. If we truly accept the worst then we can take action to improve upon the worst. Worrying doesn’t do any good in the long run, it only hurts us. Let’s practice a few if not all of the suggestions above and become a little bit more relaxed and worry less. I would love to hear from you. Please let me know what worked for you. Categories: Helpful Tips | Tags: Ask for help, Helpful tips, Ideas, support, Worry | Permalink. Based upon the results of the poll, the winner is WORRY. Almost 50% of the people that participated, including myself say we worry too much. I see this is a burden for so many. That gave me a great idea to post about all of us worrying too much. Maybe by me writing about worrying, it will help you and me from worrying so much. 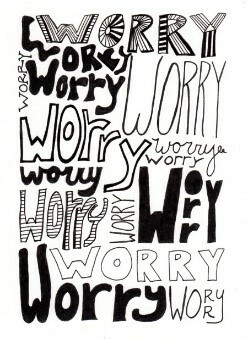 According to the dictionary, worry means to: torment oneself with or suffer from disturbing thoughts; fret. When I read this I literally said “WOW” out loud. We are torturing ourselves. I said to myself, “who, in their right mind would torture themselves, that’s just nuts. Then I answered, “oh yeah, I do almost every day. Let me share a little bit. I may have mentioned this in a prior post or in my book “Making Decisions”, but I am a control freak. I like order, plans, lists and having a great idea of what is down the road. I am not sharing, to make you feel sorry for me. I am letting you know that I am just your average girl that struggles like everyone else does and you are not alone. By sharing a little bit of my story, my hope is to help others and even myself become better people. I may not have had the best adult life (yet) with an ex-husband that wasn’t the nicest man, going through a divorce, a custody battle, raising my son on my own, seeing so many of my aunts, uncles, cousins, friends, co-workers and grandparents pass away (about 40 deaths in 25 years), financial issues, losing a home and my job. GEEZ!!!! Just listing these things makes me see how I am prone to worrying. When I lost my job about 8 months ago, that I had worked for almost 14 years, needless to say, I was freaked out and worried. 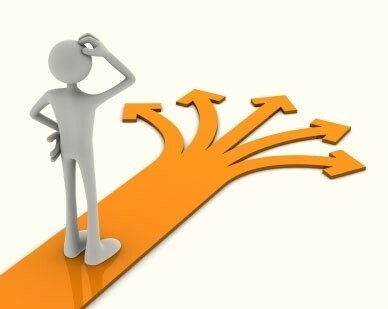 I am very fortunate that I am able to take some time to figure out what my next step is. Which is still a work in progress. I have been given the opportunity to reinvent myself. I am taking advantage by, taking my time, trying a few new things that I love, like writing and waiting to see where all of this leads me. But I still worry about my future, what it holds, where my career will lead me or where this ‘time-off’ journey will take me. I worry about my son and his future, my parents that are sick and my cousins that are sick. I just read the above paragraphs and thought…..Boy, I’m depressing. I would stop reading this. Hang in there with me, please. I’m getting to the more positive stuff. Since I have lost my job things are very different. I didn’t realize that the job was toxic for me. I am more relaxed, less stressed and no longer have headaches. I am happier. That job caused me to have blinders on and I couldn’t see past that job or the next paycheck. That’s not a great way to live my friends. In the past 8 months I have been able to relax more, sleep better and really go for something I have wanted, like write 2 short books, start a blog, get a little crafty, get myself organized, help others get organized, and be there for my family. Granted none of these things has brought any money in (for now), but I am happy (sane) again. No amount of money can buy your happiness. With doing these things I have realized that being in control is out the window. To my surprise, I am ok with that. I still worry about my future, but I worry less about my folks, my kid and cousins. I see now that these are things that I really can’t control. For me, having this time to really reflect has been therapeutic. I am a work in progress but it’s getting better. I have come to the conclusion that I will probably always worry about my own future, but to worry about others and their future is a waste of my energy. I need to put that energy into helping my family and do what I can to help others, by writing this blog and books. I know it doesn’t seem like much but just like the other posts, we have to find our happy. Writing and helping others, makes me happy. I guess what I am saying is, don’t waste your time with worry, Spend your time making yourself or others happy. Categories: Helpful Tips | Tags: Happiness, support, Worry | Permalink.